I have a Windows Exchange 2010 and I need to grant folder access in Outlook 2010 to another user. I have someone in our company that had left and now i need to grant emails to a assigned folder in the Outlook so his ex-boss get all his emails. 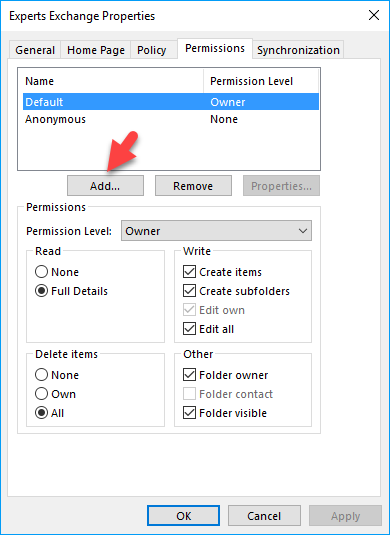 have you tried right clicking on the folder and selecting properties / permissions? This example assigns permissions for Ed to access Ayla's Marketing mailbox folder and applies the Owner role to his access of that folder. here is the script that I use to grant a user read-only access to existing mailbox. $Mailbox = read-host -prompt "Enter username of the mailbox that needs to be accessed"
$User = Read-Host -prompt "Enter username of the person that requires access"
Write-Host -ForegroundColor Green "Granting $User $Access Rights to $Mailbox mailbox at the top level"
Write-Host -ForegroundColor Yellow "Granting $User Reviewer Rights to $Mailbox all mailbox folders"
Write-Host "Adding $user to $identity with Reviewer permissions"